Recently Tracey and I visited New Orleans and went on a 7-day Western Caribbean Cruise. I know you may be shocked at this, but two of our very dear friends were getting married on the ship right before it sailed, and invited anyone who went to the wedding to also go on the cruise with them. We didn’t have anything else planned travel-wise for the spring, so we figured we’d try it out. We flew down late Friday night to NOLA, and took a taxi to our AirBnB in Bywater. Now I’m not sure if you know about New Orleans, but Bywater is the neighorbood that basically everyone says “ohhh, there. Don’t walk outside at night.” But whatever, right? We’ve been all over the world and live in the middle of a fairly large city. And I even spent four years living right next door to the Unsafeway in the U-District and the criminal nexus of that neighbourhood: Jack-in-the-box. But Bywater. Yes, it was basically everything people had said about it. We were staying in an adorable duplex with hardwood floors, soaring ceilings, and a quirky decorating job. Oddly enough, there was a very good pickle-themed vegan restaurant four blocks away from our apartment. The pickled strawberries were unusual and also excellent. The walk four blocks back was not so excellent, but we managed to avoid becoming crime statistics so it all worked out. The day before the wedding, we went and met our friends Katy and Meg to go explore part of the city. 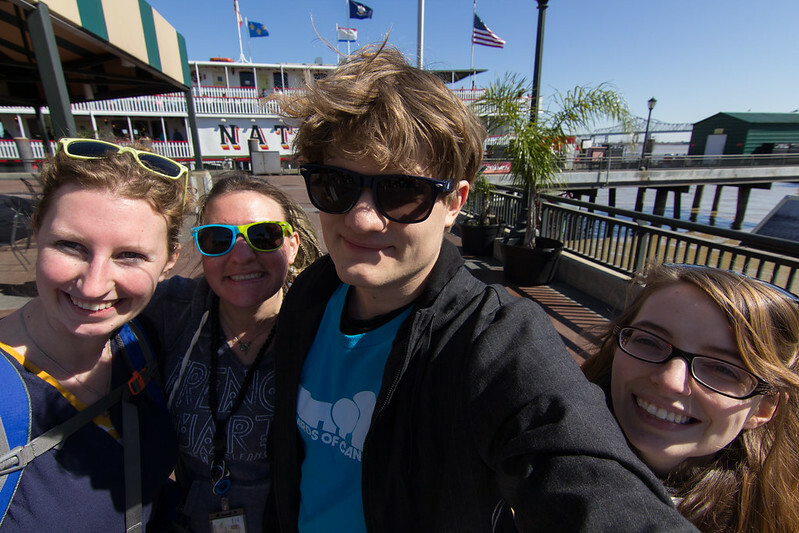 After some VERY powdery beignets at Cafe Du Monde, Katy led us on a walking tour around French Quarter. 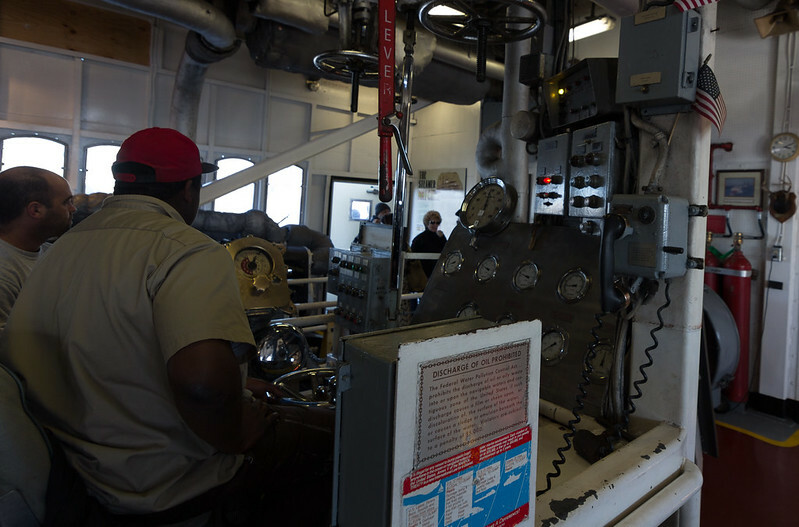 We checked out some hot sauces, old buildings, and eventually looped back to take the steamship Natchez for a 3 hour tour of the river.The ship was pretty rad, as you could actually visit the engine room and see the powerful engines in action as they slowly moved the piston that powered the paddlewheel. As we passed down the river banks, the devastation that Katrina wrought was visible in destroyed piers, repaired levees, and shuttered buildings. 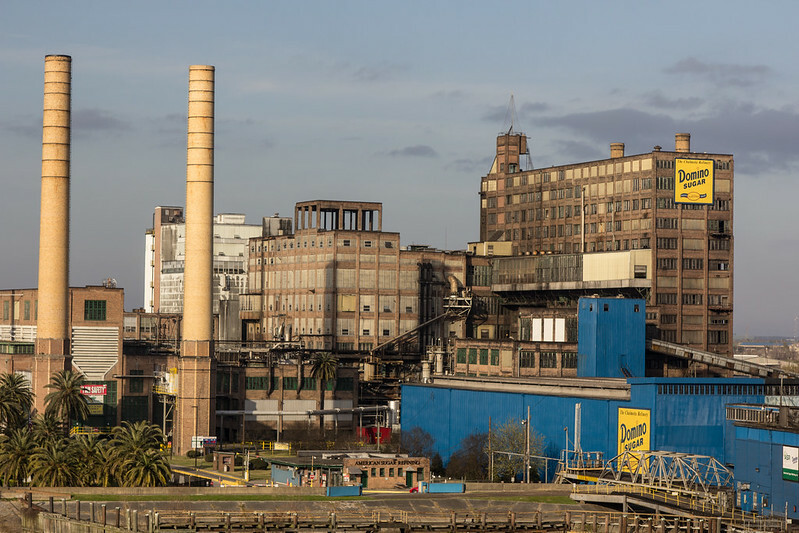 Further down we detected a sickly sweet smell: the diamond sugar refinery! 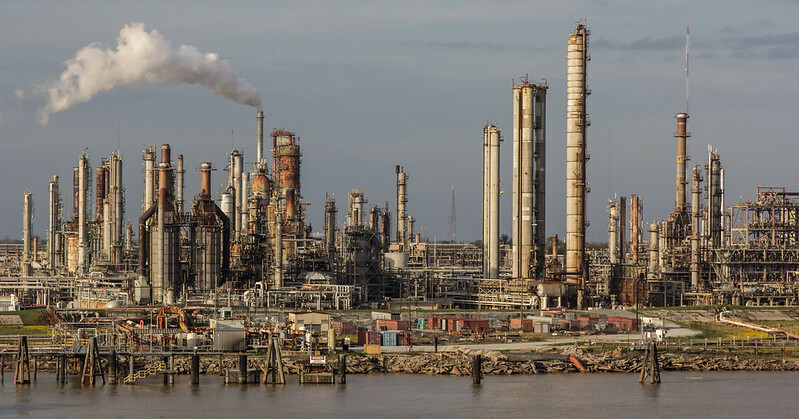 NOLA is also into oil, so there was naturally a very imposing oil refinery. Sunday Morning, Tracey and I dressed up and made the trek to the cruise terminal. We had an early check-in because of the wedding. Aha, you see, the wedding was actually taking place on the ship, but before it sailed, so anyone not going on the cruise could still come to the wedding and then get off the ship before it sailed. Anyway, we get cleared and as we’re walking on the ship, we notice a body bag being removed from the Carnival Dream. Yes, someone had so much fun on the cruise they actually died on it. It was a foreboding symbol. I wander back to encounter a slightly flustered Carnival photographer who hands me his very high-end camera, lens, and flash before muttering some super basic instructions. Luckily it was a Canon and the functions were fairly similar to my 60D. Nicer, of course, but still close enough. So anyway, I took a lot of pictures during the wedding. I guess it’s better to be behind a lens while getting teary eyed during the wedding than being photographed. The reception happened for a few hours and then the wedding was over. To our rooms we go! The cruise room was whatever. It was a fairly bog-standard room on deck 6 with a balcony. Small, but workable. We settle up for a bit before having the safety drill and then were free for that evening and two full “fun” days at sea. Well, there’s not a whole lot to do on a cruise. You mostly eat. Eat a LOT. And also sleeping and reading. Those are the main things you do for those days where you’re at sea all day. 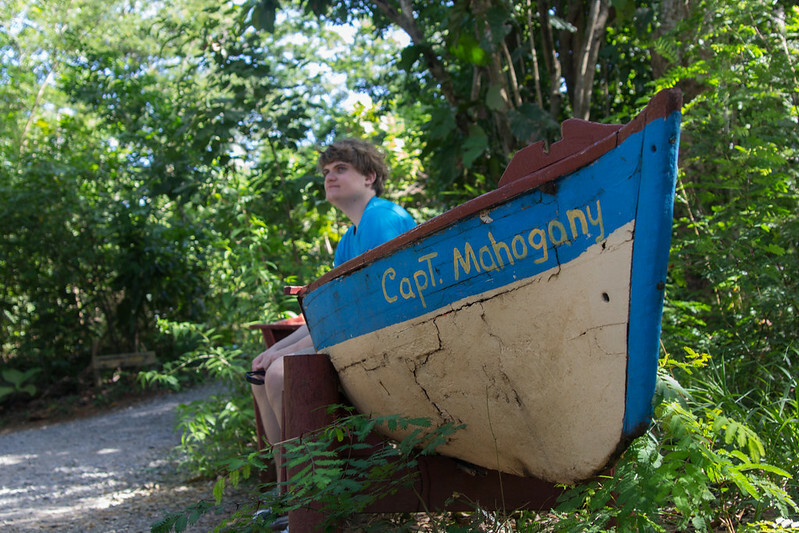 Our first stop was to the Island of Roatan in Honduras. So here’s the thing about cruises: the people on them really really hate hanging out with the locals and seeing authentic experiences. If we’re normally backdoor travellers, they’re front-door travellers while driving tanks around (and over) wildlife on the way to duty-free alcohol stores. Mahogany Bay is a small bay on the island that had a $62 million dollar complex built by Carnival to serve cruise ships. There’s a shopping plaza (cruise members only! ), a private beach (cruise members only! ), and even a Harley-Davidson store. We mostly spent time at the nature trail. The bay appeared to have some shipwrecks at it. These did not appear to be fake. While it was possible to leave the duty-free shopping extravaganza, there wasn’t anywhere to go on the island that wasn’t built for tourists. Okay, so this was mostly a wash. We spent the time on the ship. Interestingly enough, soon after we landed and most of the passengers disembarked, they started the crew muster and evacuation drill. 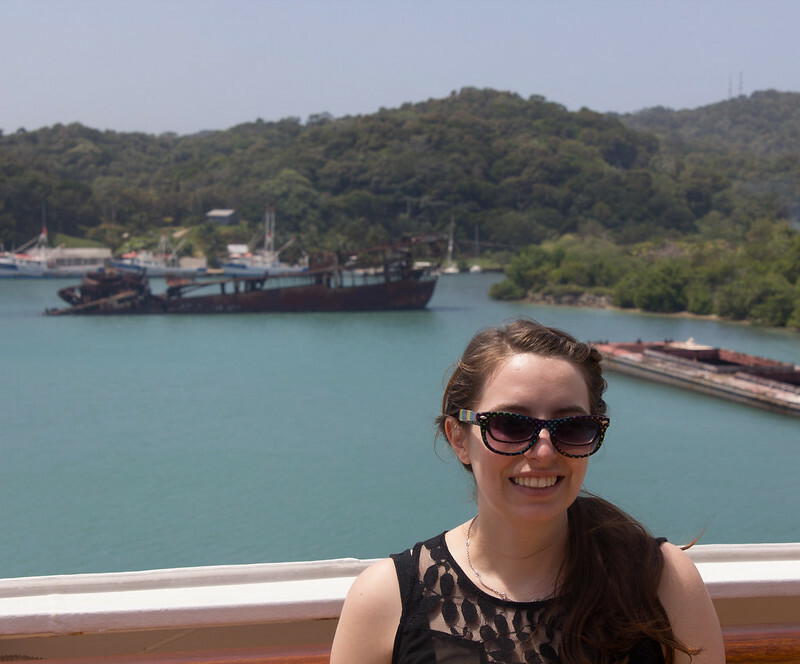 It was very odd to be standing next to a giant ship on a tropical island where evacuation alarms echoed throughout the bay. Naturally I was intrigued by the whole process. 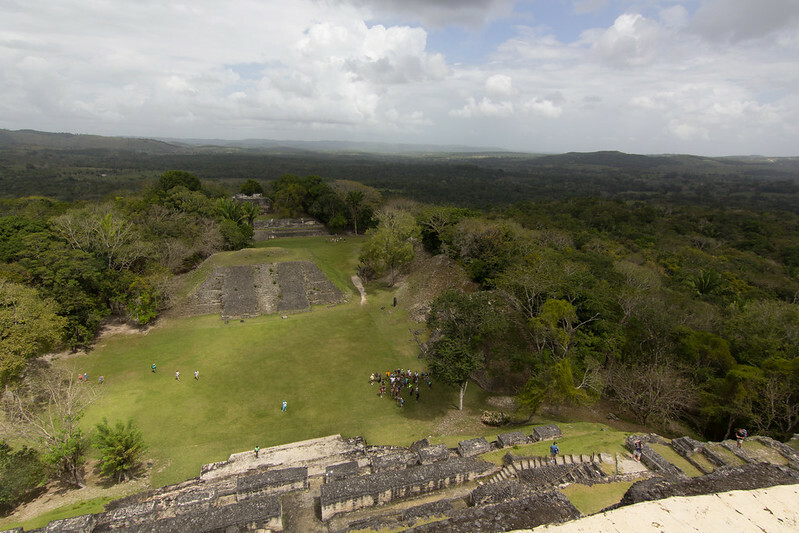 Thursday’s stop was Belize City, and our excursion to Xunantunich. 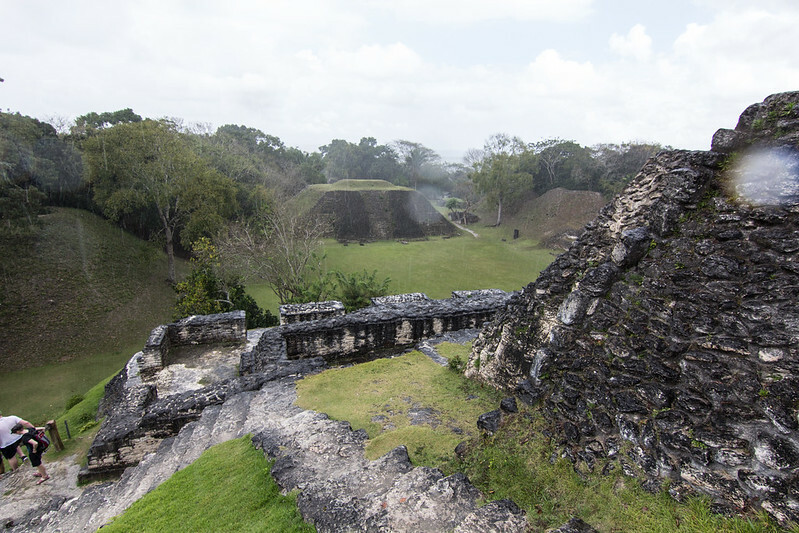 These are Mayan ruins located in Western Belize, and we boarded a bus that took us through the city proper before spending 90 minutes on the main highway deep into the country. 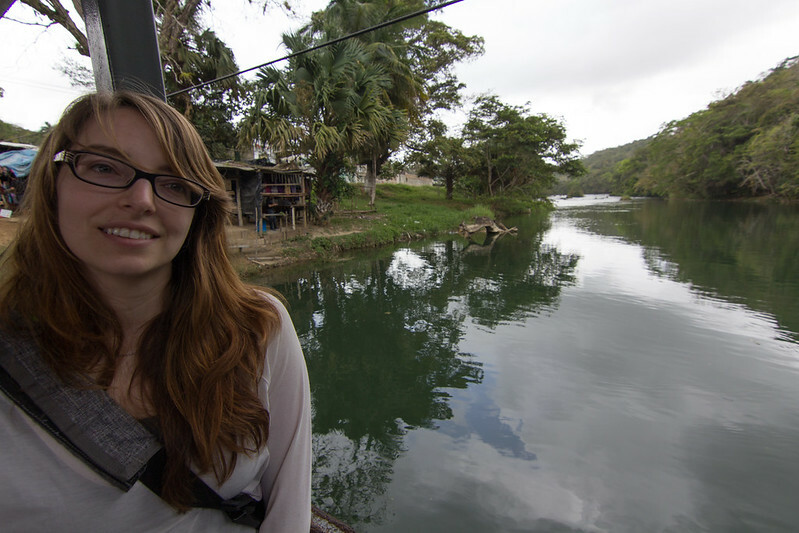 This bus ride was probably the most interesting part of the whole cruise, as you could see the economic condition Belize was in. And uh, well, I was pretty depressed for a long while after that. It almost felt exploitative being there and staring at abject poverty from an air conditioned bus. Soon enough we arrived at a hand-cranked ferry. 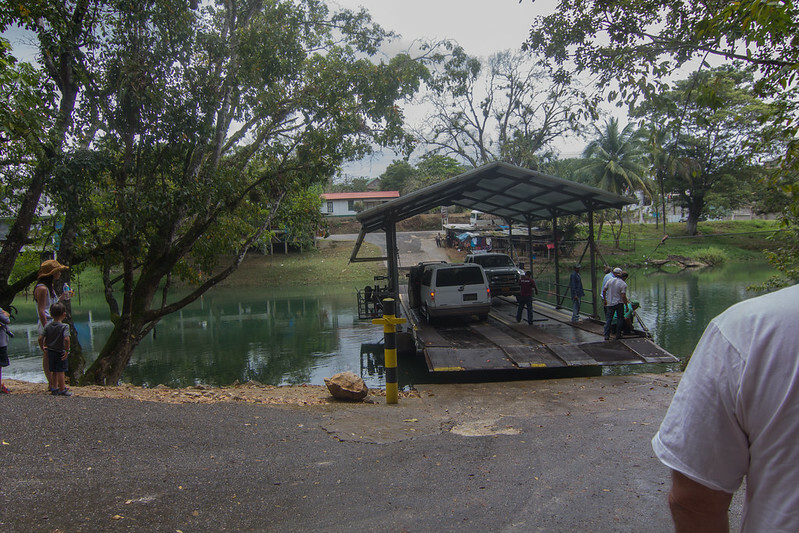 The ferry was far too small to hold the bus, so we all got off and took the ferry across a small river. 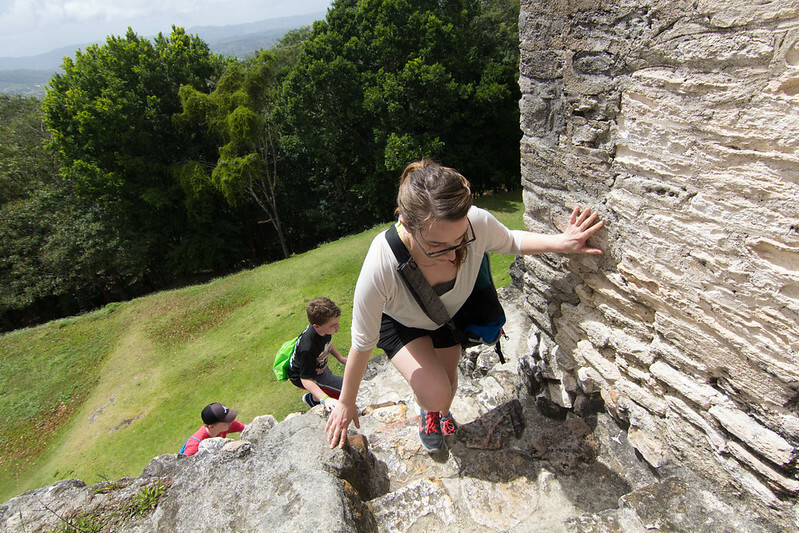 A short van ride away, and then Mayan ruins! The weather was quickly turning to rain, and we quickly started climbing the largest structure before the park authorities kicked us off: they don’t let you climb it when it’s raining because it gets exceedingly slippery. It was a pretty nice view from the top, all things considered. You can’t really see it here, but it’s raining. A LOT. We loaded back on the bus, went to a big open-air restaurant for some very tasty rice and beans cooked in coconut cream before getting back to Belize City. In Belize, they didn’t have the facilities for cruise ships to dock (or Carnival didn’t want to pay), so it was a tender day. That’s where a bunch of random boats show up to whisk you back and forth the few miles between the ship and the port. The last tender back to the ship left at 16:30, so naturally half of the ship arrived at 16:28. Needless to say, the last tender didn’t actually leave until 18:00 or so. Our final stop, on Friday, was Cozumel in Mexico. After going on a long walk to the center of town with Bridget and Steven while looking for “hat pins,” we decided to hit up a beach. The only problem? Six cruise ships showed up that day and all of the beaches were crowded. So we went to a smaller beach slightly north of the town on the recommendation of the taxi driver. Sure, the driver likely got a kickback and we were probably charged more to get into the beach than normal, but it was still super cheap so we didn’t mind much. The beach was nice. Plenty of guacamole, tacos, sun, and sand. We took a taxi back to the ship and Steven and I quickly ran to the top of the ship to ride on the water slides before all of the annoying kids showed up. The plan worked perfectly! No kids in line and we could ride the slides! And that’s the cruise, really. Sometimes they made you dress up for dinner, you could eat as much as you wanted, and they had 24/7 soft serve machines all over the ship. We got a lot of reading done, and caught up on a lot of sleep. In compensation for doing some professional wedding photography, they offered Tracey and I a meal at the exclusive steakhouse onboard. Despite us being vegetarians, they made us some outstanding off-the-menu stuffed cannoli before bringing us a complimentary bottle of some very tasty wine. Would we do a cruise again? No. It was too relaxing and too slow-paced for our travel style. Still, I think it was an educational experience that was even fun at some parts.